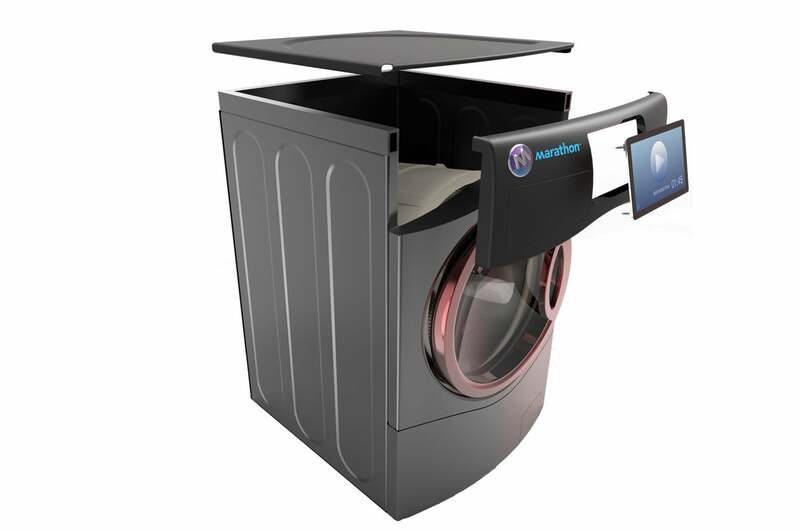 Marathon will show its first product, an all-in-one washer/dryer combo, at CES next week. Glenn Reid, a tech-industry veteran with stints at Apple and Adobe on his resume, is looking at a dozen laundry machines in various states of disrepair when he calls me. He’s trying to figure out how to construct a washer without 30 pounds of concrete anchoring the base, but there’s a huge problem: Concrete keeps your typical washing machine from toppling over during the powerful spin cycle. Reid wants to design a product that can stay upright on its own for his appliance start-up, Marathon Laundry. Marathon Laundry's washer/dryer combo will have a powerful CPU and a touchscreen display. Tesla Motors and SpaceX CEO Musk comes up several times in my conversation with Reid, who will take the wraps off a smart electric washer/dryer combo at CES in January. It still has concrete in its base, but Marathon’s machine puts both a washer and a dryer in the same enclosure. Unlike previous failed attempts to combine the two, Marathon’s machine will be vented—Reid promises it won’t take five hours to dry your clothes. The machine is also priced to compete with other Internet-connected washing machines at $1199—and those rival machines need dryers alongside them, where Marathon’s does not. Marathon’s Wi-Fi-connected washer/dryer comes with a touchscreen panel and a complementary smartphone app to act as a remote control. The machine has an A9 processor, 1GB of RAM, and an equal amount of storage. It was originally based on Android, but Reid chucked the OS because it “was more complicated than it needed to be.” The machine communicates with your phone and collects data about what you wash, when, and at what temperature. Reid is in discussions with power companies in major cities to negotiate better rates for buyers, so when you put a load of laundry in before you go to bed, your Marathon machine will delay the start of its first cycle until power rates go down. The machine will have just one drum for washing and drying your clothes, eliminating the need to transfer them from one appliance to another. Marathon Laundry is up against some major competition: Companies like Samsung, LG, Haier, and Whirlpool have dominated the industry for years. The home appliance space isn’t prone to shake-ups because washers and dryers are expensive to produce and tough to market—people tend to go with trusted brand names. But Reid thinks the industry needs to be turned on its ear, just as Tesla did to the auto industry. 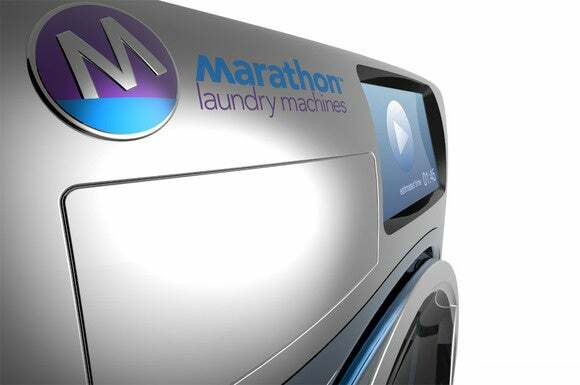 Those barriers to entry are real, which is why Marathon’s first machine combines an OEM washing machine with the startup’s own CPU and dryer parts. After nailing the first version, Marathon will work on building a machine from the ground up—just like Tesla. Of course, there’s the question of how a person is supposed to wash and dry multiple loads of laundry with just one machine. Marathon plans to market the machines as a pair—you don’t have to buy two, like you do with a washer and dryer, but it will make life easier if you do. Reid will show Marathon’s machine to the public for the first time at CES, where the startup’s competitors will also be exhibiting. He wants them to see what he’s up to. Marathon is currently taking preorders online and is in talks with retailers for physical distribution. Reid expects to begin shipping the machines by June. We’re taking a close look at the machine while we’re at CES next week, so check back for our first impressions.